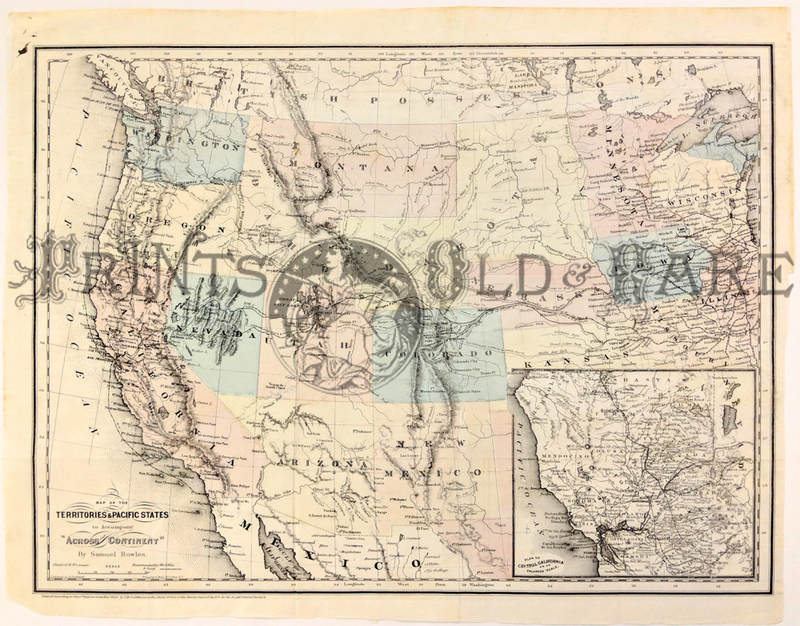 Antique United States Prints and Maps. 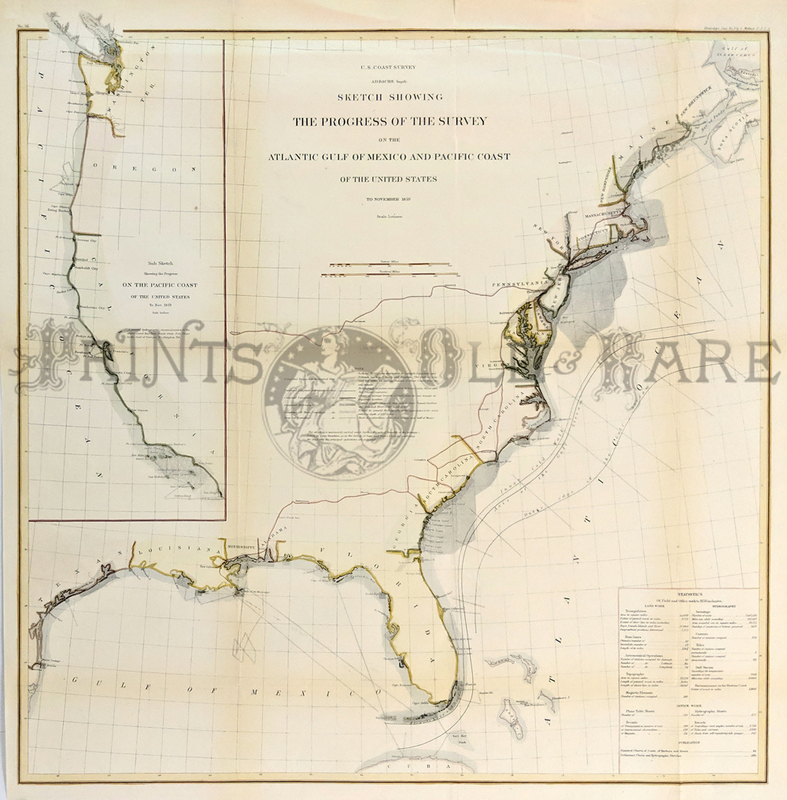 Map of the Territory of the United States from the Mississippi River to the Pacific Ocean. 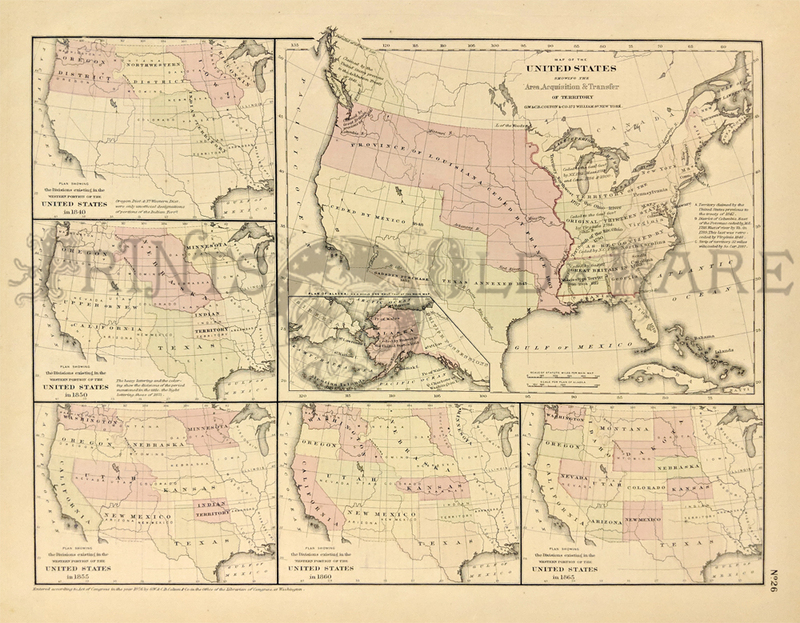 1854-57 Lithographed Overview for the U.S. Railroad Surveys. Map shows locations, topography, routes, boundaries, and Indian Tribes. 14" x 11.5" plus wide margins. 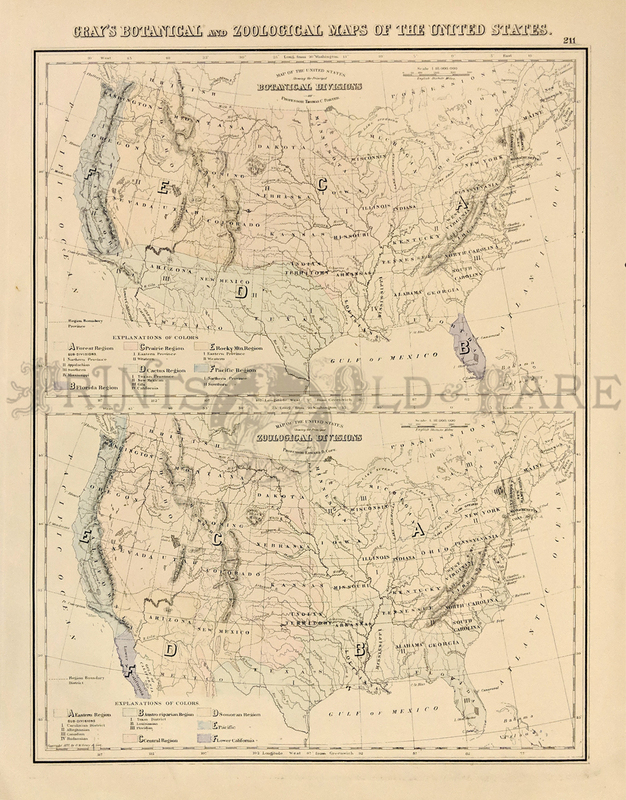 1878 Botanical - Zoological Maps of the USA. 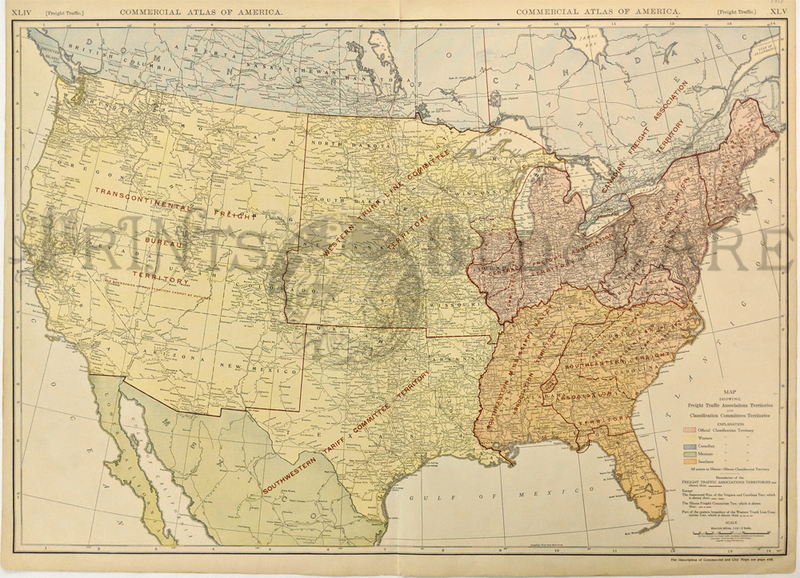 These two maps of the United States were published in Gray's Atlas of 1876. 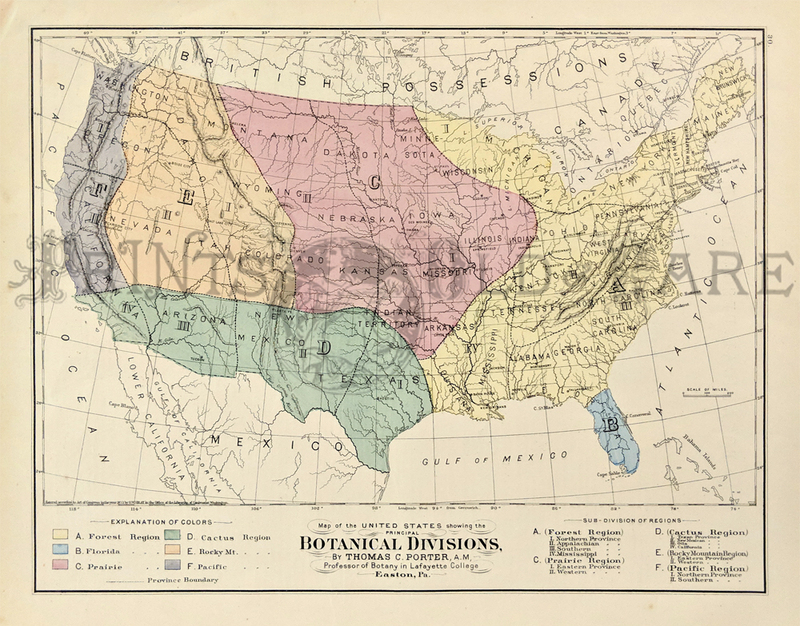 The top map is titled "Map of the United States Showing the Principal Botanical Divisions." 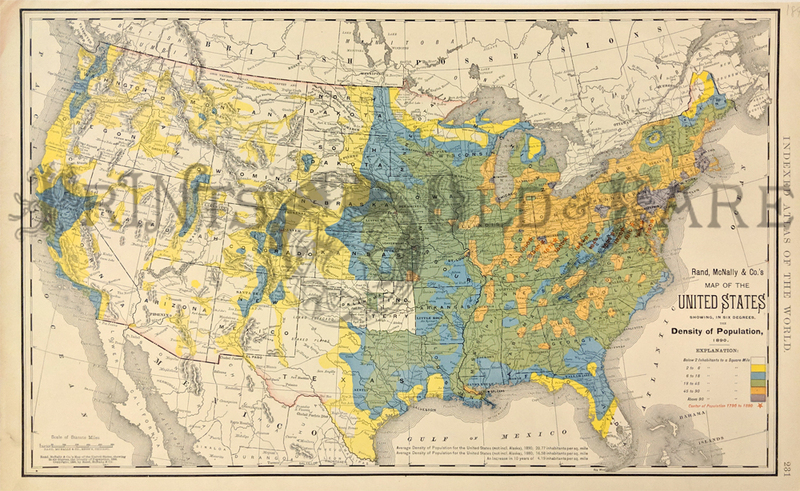 The bottom map is "Map of the United States Showing the principal Zoological Divisions. Each botanical and zoological area is identified by a different color. 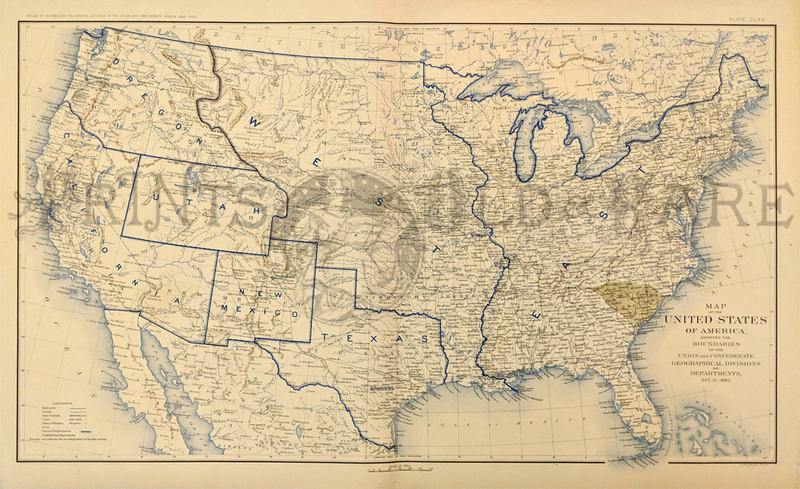 1889 Railroad Map of U.S. Scribner & Sons, attractive color litho. An amazing number of old railroad lines shown in red throughout country. 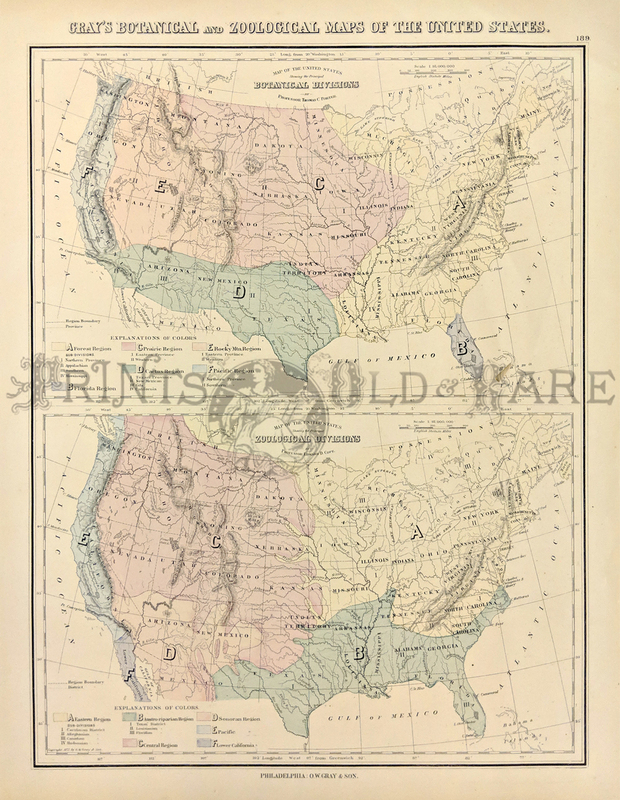 1901 Color Map of USA - NO RESERVE! 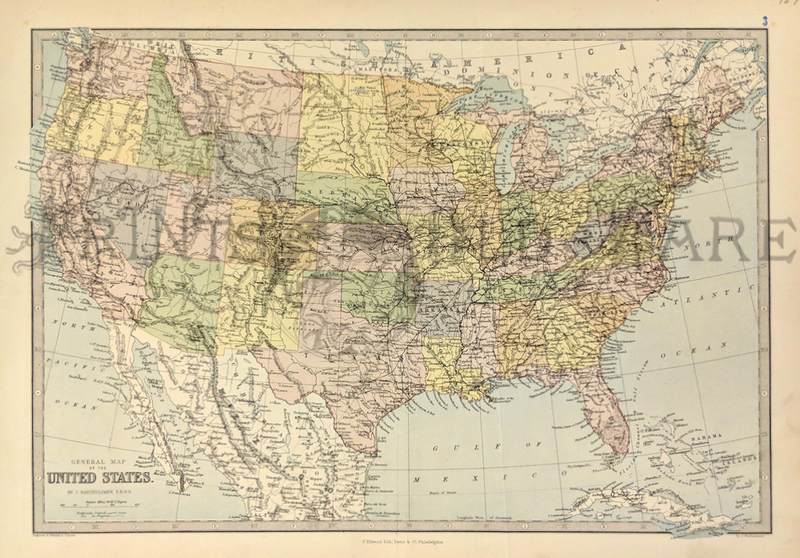 Great old color map of the United States, produced in 1901. Each state in its own color. Shows railroads, topography, major cities. Inset of Alaska. 99 years old! 1931 Department of the Interior Canada. 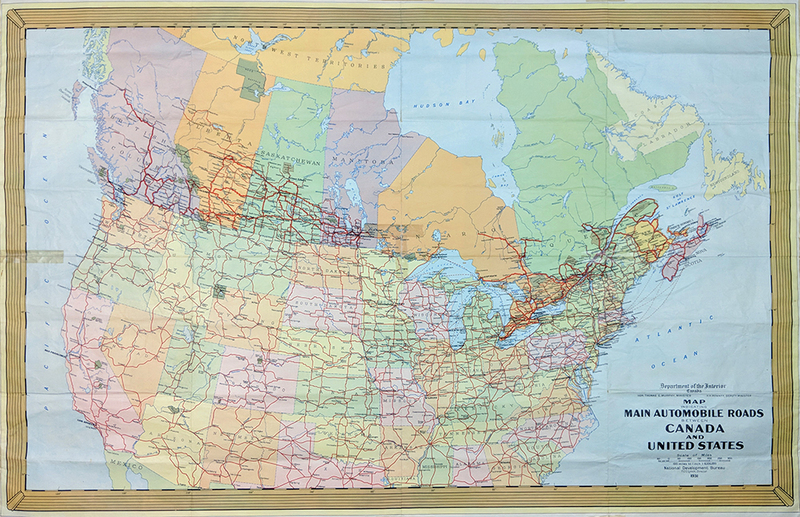 Map indicating Automobile Roads between Canada & United States. 1860 British Possessions in North America. New York and New England. 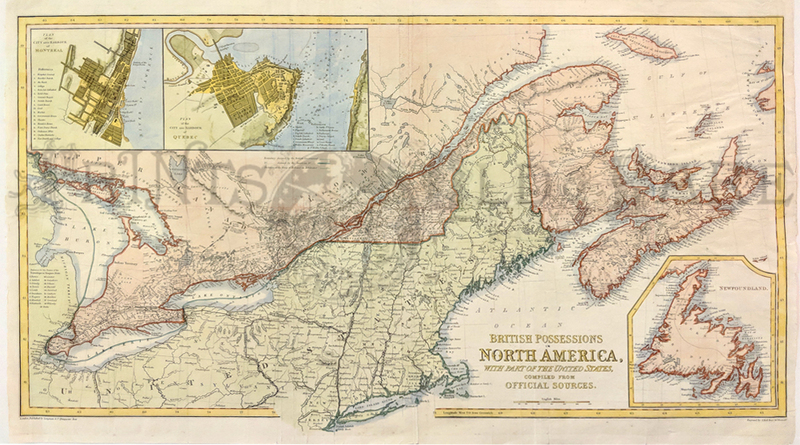 Large hand colored English map with insets of Montreal, Quebec City and Newfoundland. taken from 1844 to 1850. 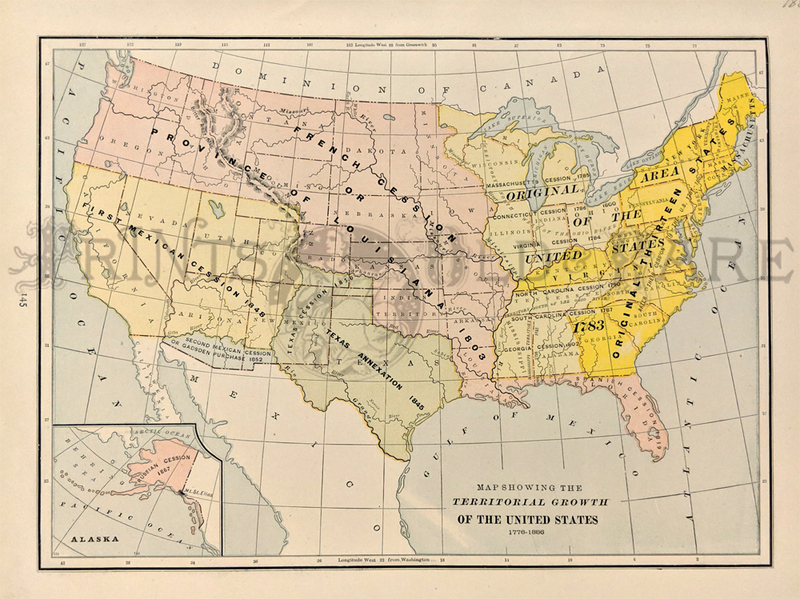 1875 Botanical Division Map of U.S. Hand colored for each region. By Thomas Porter. Printed by Gray. 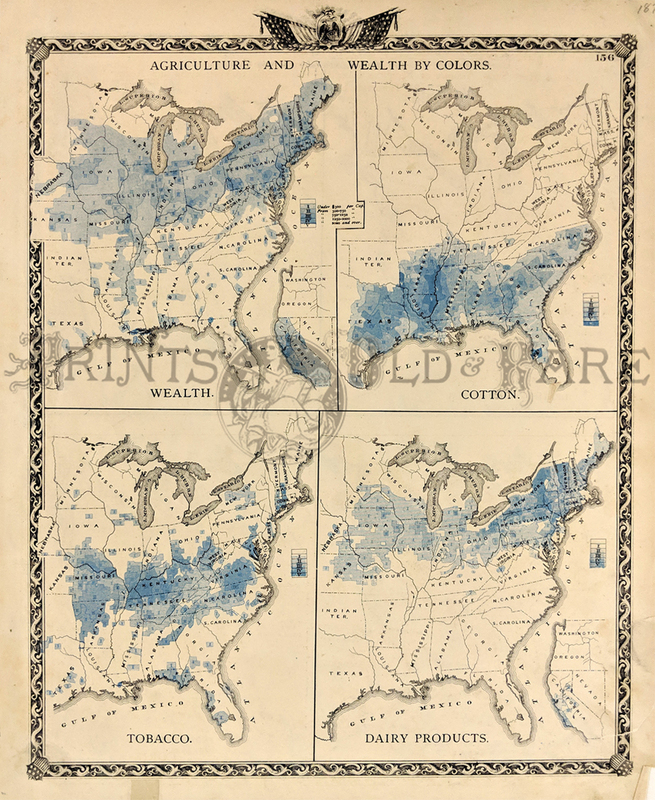 1860 Isotherm Chart ( map ) of U.S. Isotherm chart of northern United States and Canada. Hand colored. By Isaac Stevens, Governor of Washington Territory. Published by U.S. War Dept. 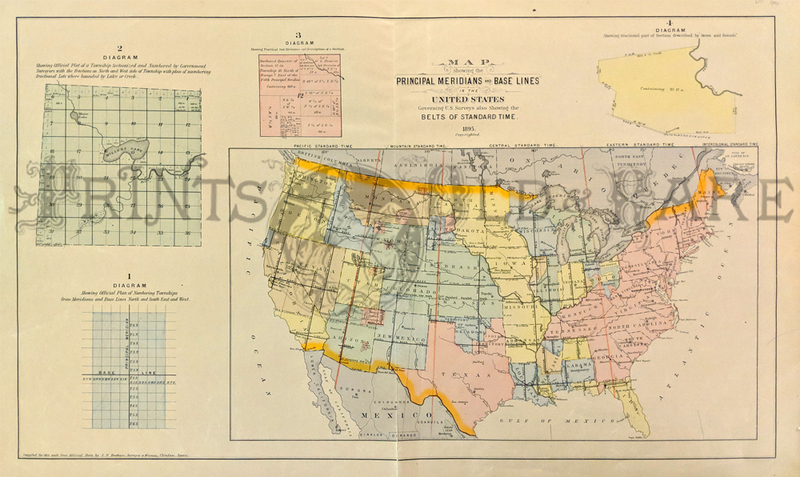 1895 Principal Meridian and Baseline Map of U.S. Includes time zones. In color with four diagrams which show plans for numbering townships and sections. By J.R. Dunham. Gray's Geological Map of the United States By Charles H. Hitchcock PH.D. Professor of Geology in Dartmouth College. 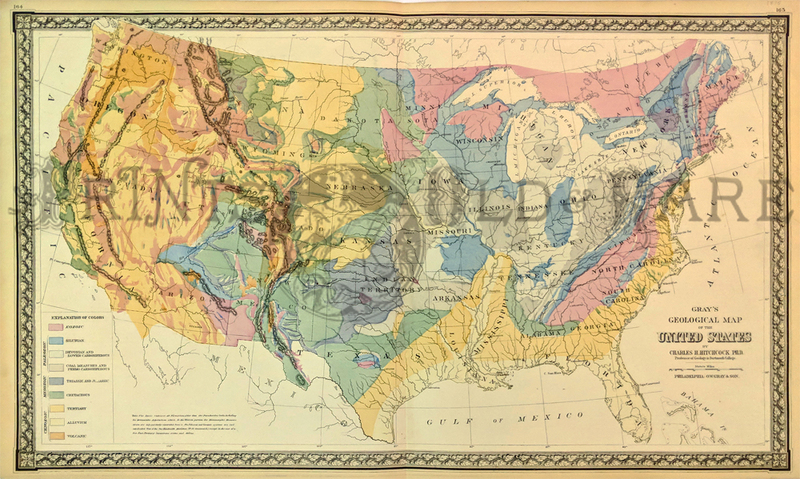 Colorful map of the United States, exhibiting the geological regions, including Ecozoic, Silurian, Devonian and Lower Carboniferous, Coal Measures and Permo-Carboniferous, Triassic and Jurassic, Cretaceous, Tertiary, Alluvium and Volcanic, each coded by color. 1875. Hand colored, lithograph. 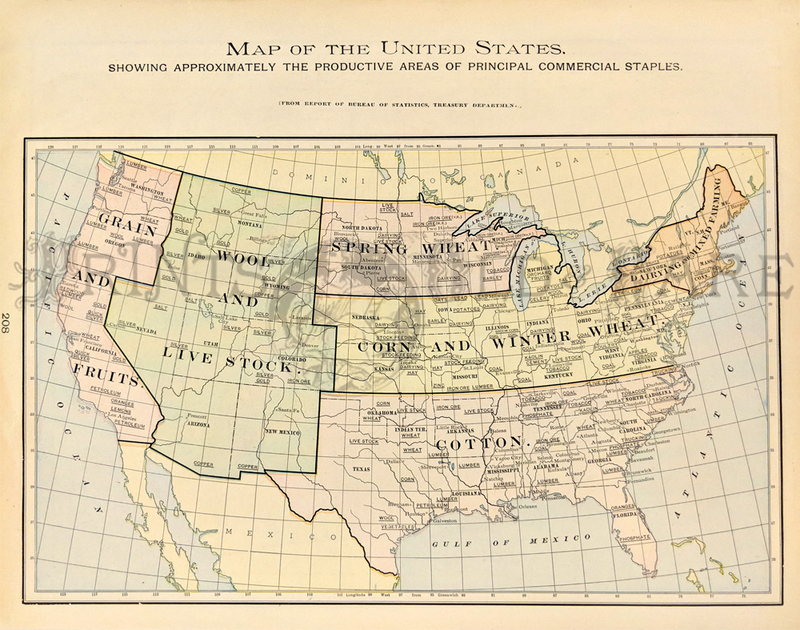 1876 Wealth and Agriculture U.S. Map. Early eastern United States, by colors. Four maps on one page. Shows concentrations of wealth, and industries of cotton, tobacco and dairy. Slight stain in upper margin. Nice border. 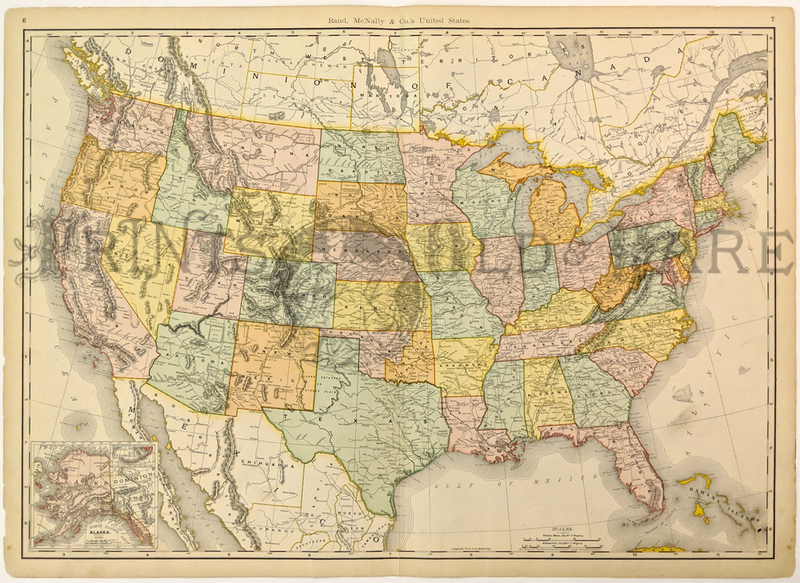 1875 Rare color Gray's Historical Maps of the United States showing the Acquisition and Transfer of Territory in center map and the British Possessions and other historic references showing expansion of the United States. 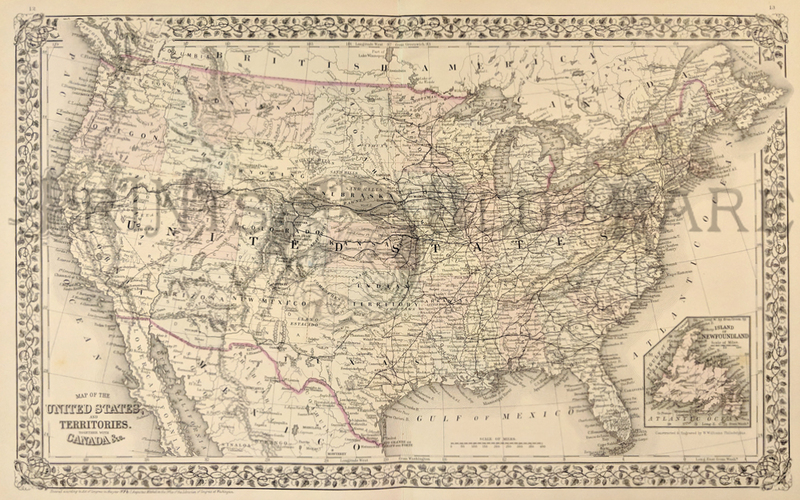 1876 Botanical - Zoological Maps of the USA. 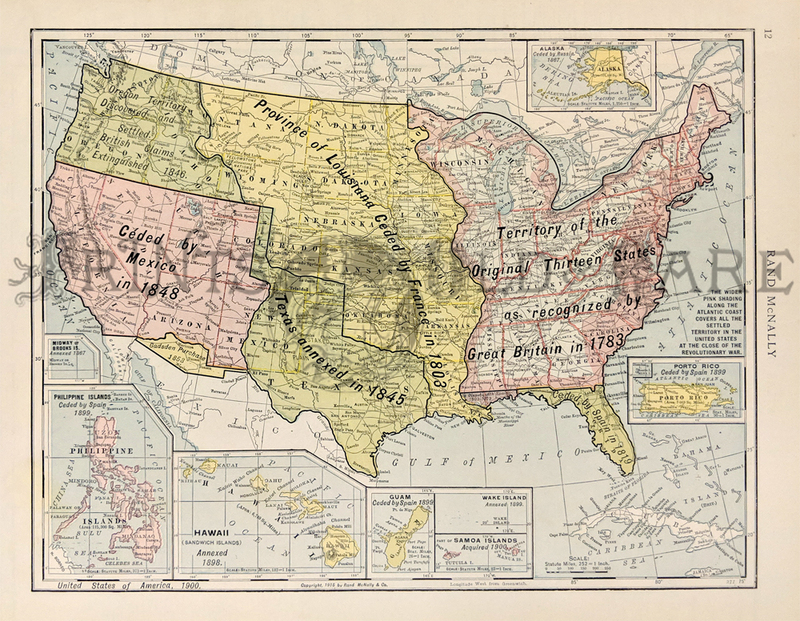 These two maps of the United States were published in Gray's Atlas of 1876. 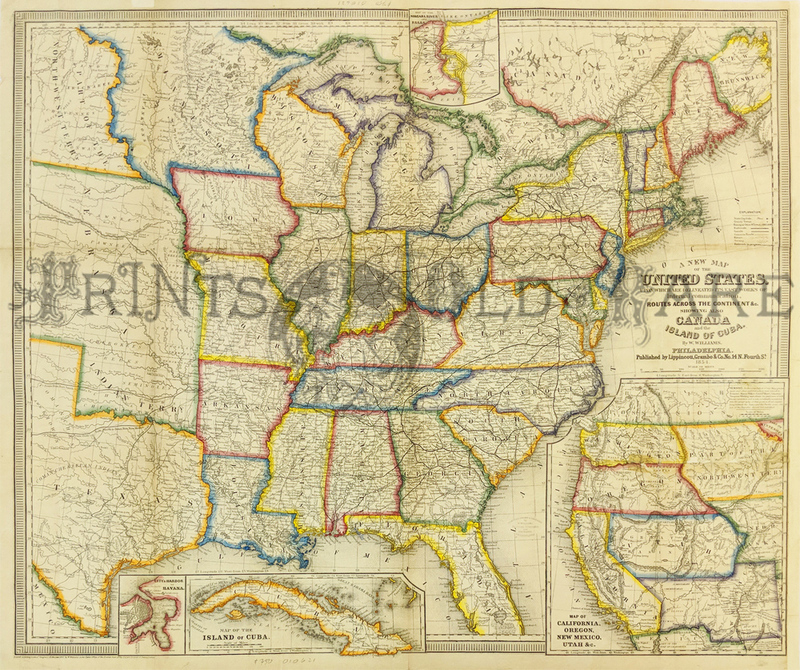 The top map is titled "Map of the United States Showing the Principal Botanical Divisions." 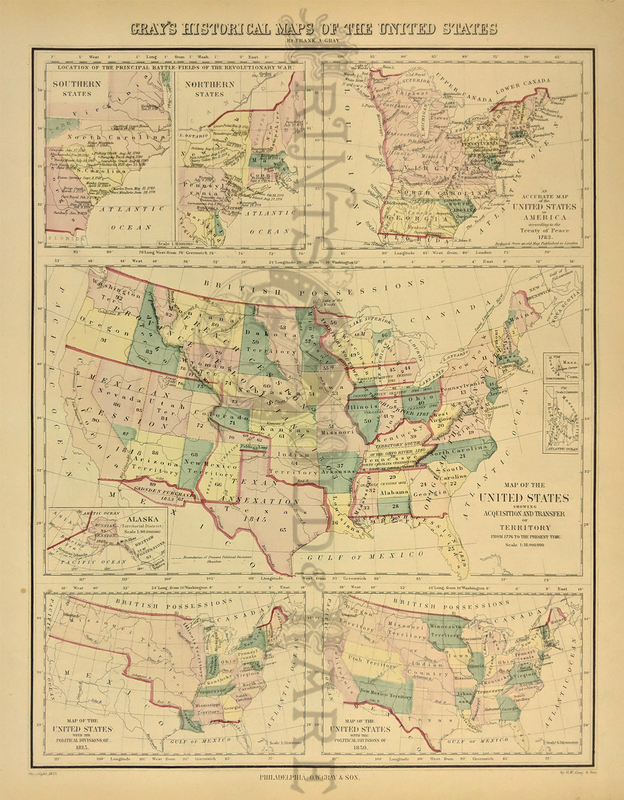 The bottom map is "Map of the United States Showing the Principal Zoological Divisions." Each botanical and zoological area is identified by a different color. 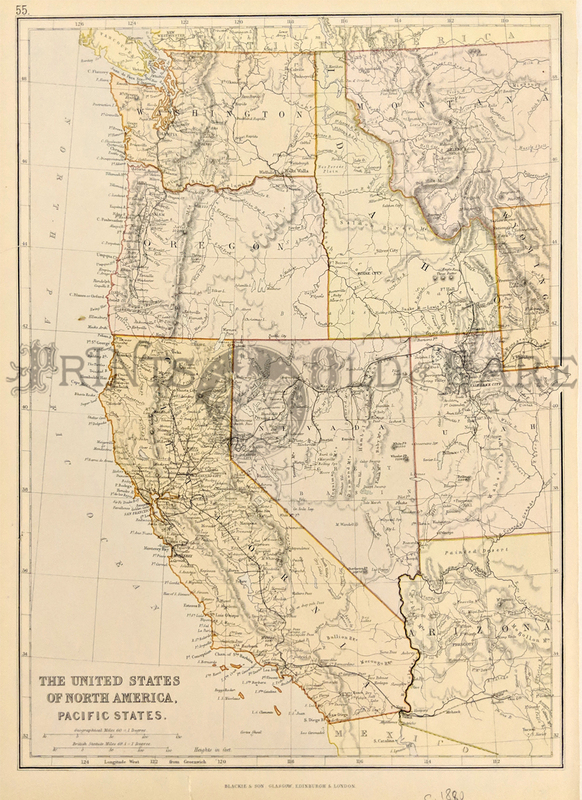 1850 Cowperthwait color United States map which shows the Gold Regions of California on bottom left inset and an inset of Washington, D.C. on bottom right. In this map, the west is mostly still territories. Top right border has been repaired. 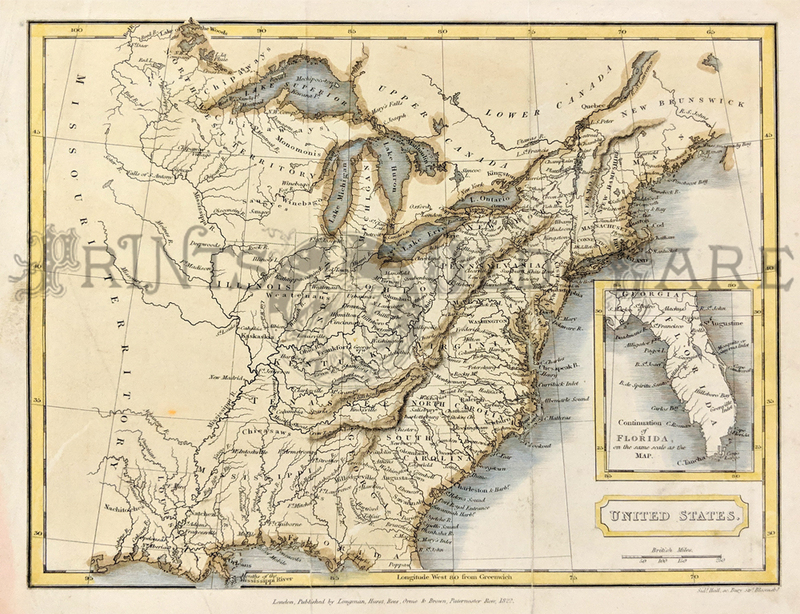 1822 Rare color Map of early United States with inset bottom right of early Florida. Published by Longman, Hurst, Rees, Orme and Brown, Paternoster Row. 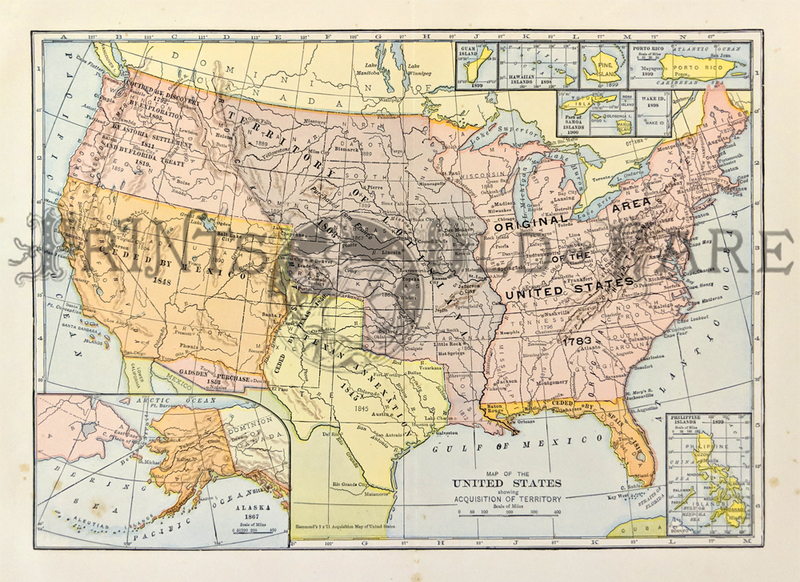 Map of the United States from the 1902 edition of the People's Atlas. 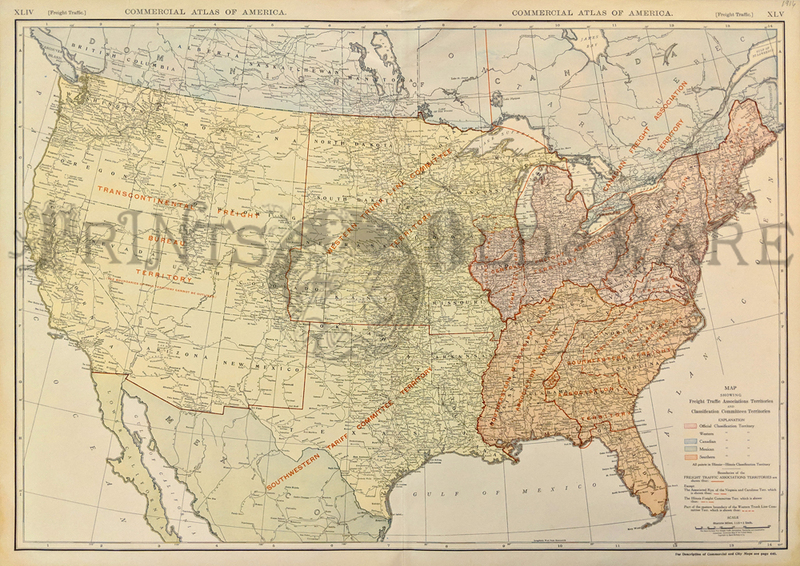 Map shows US territorial acquisitions from 1783 through the Spanish American War in 1898. The 1900 acquisition of part of the Samoa Islands is also included. 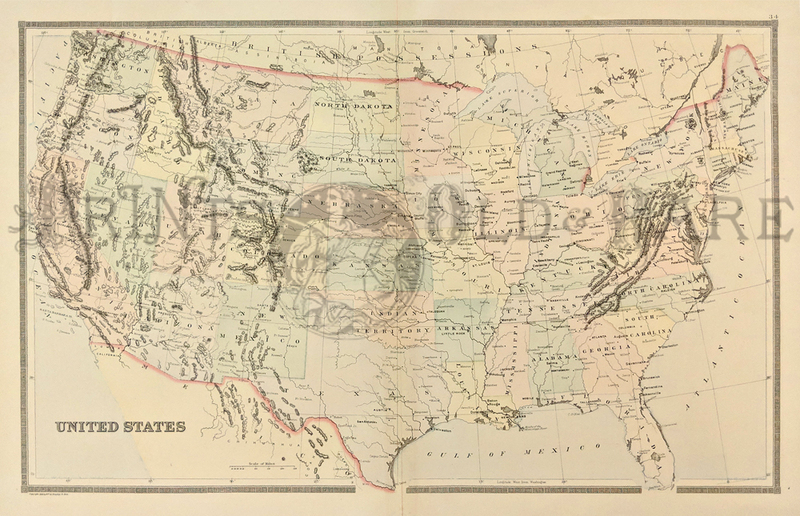 1875 Map of the United States by Gray. 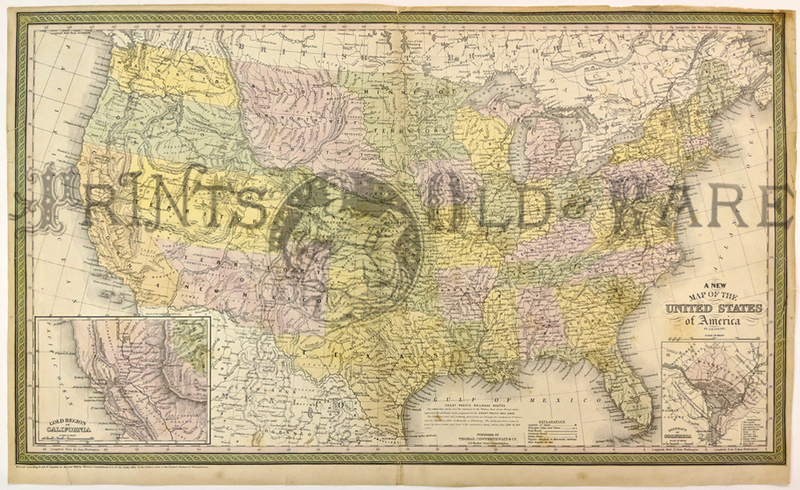 Interesting map, with original hand coloring, from O.W. 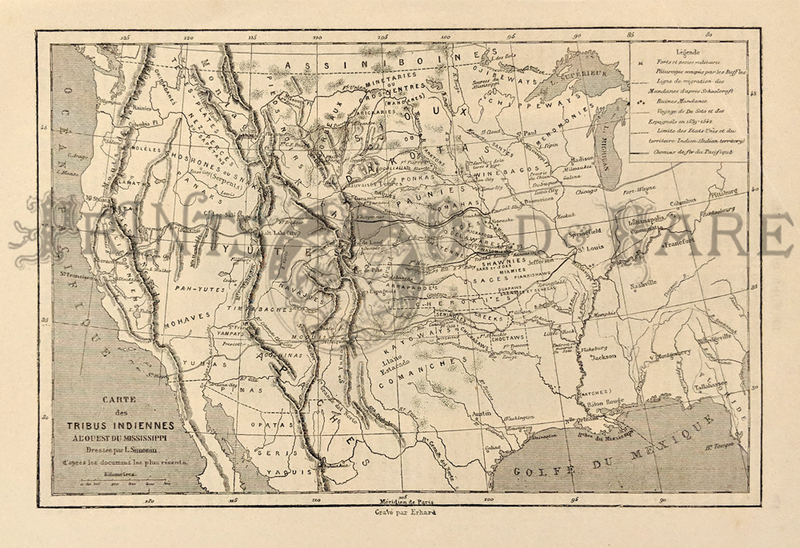 Gray's world atlas of 1875. 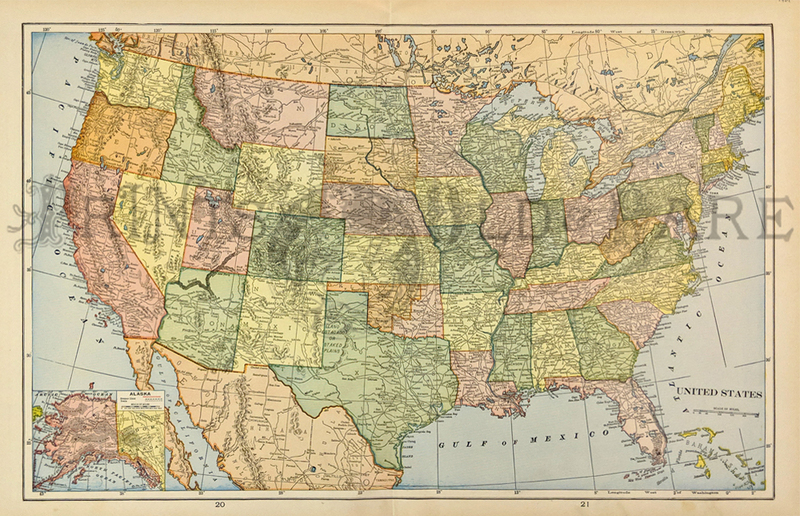 Each state is separately colored. Cities, towns, railroad lines and geographical features are all shown. 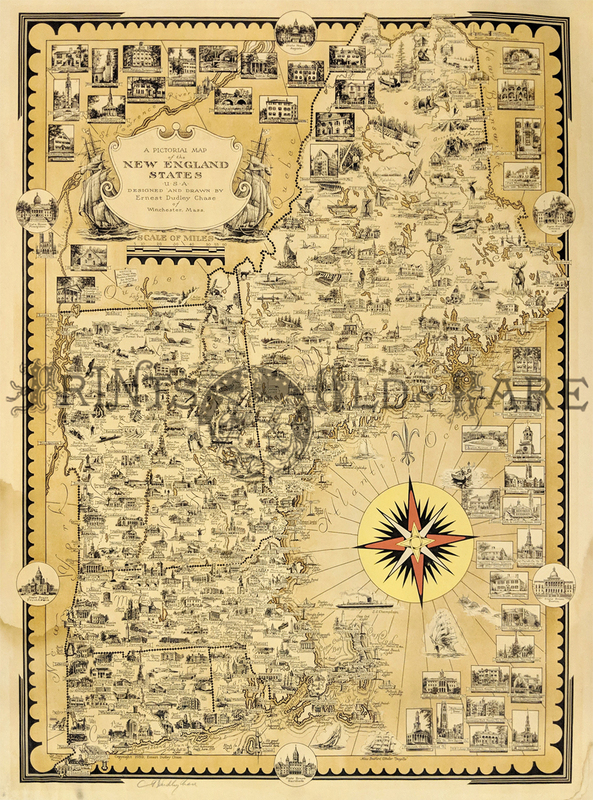 Very attractive antique map which would look great in a frame! 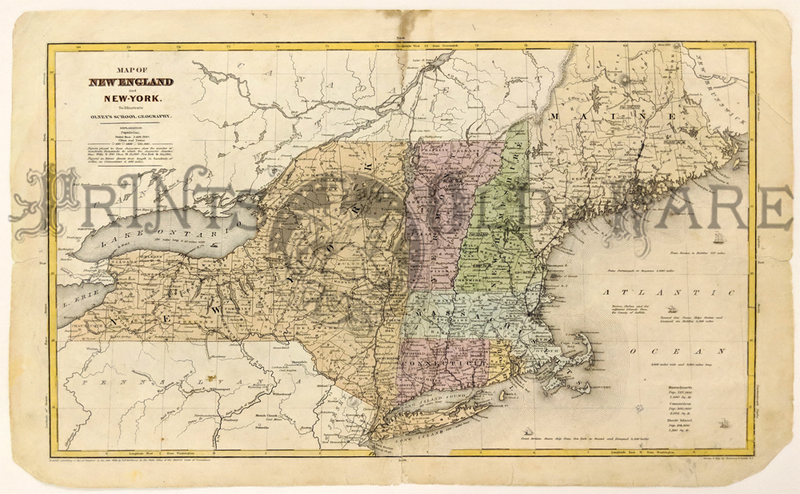 1844 Map of New England, New York. 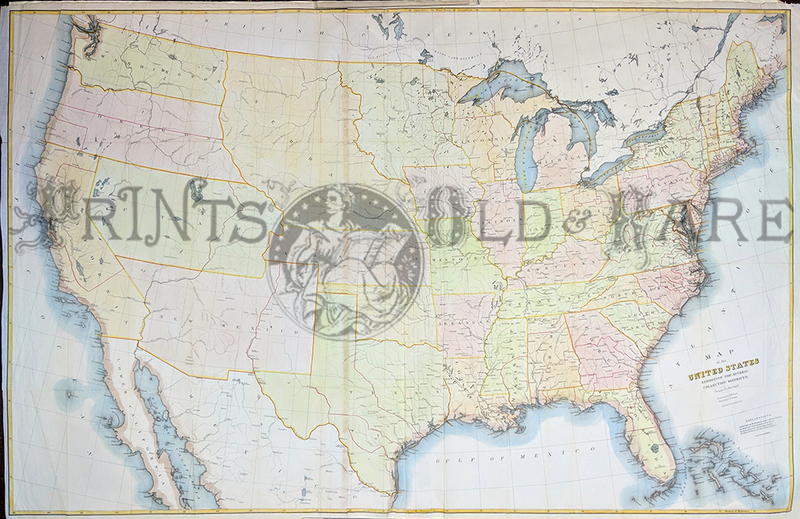 Hand colored map from the 1844 edition of Olney's School Geography, drawn and printed by Sherman & Smith. Shows the states of New York, Connecticut, Rhode Island, Massachusetts, Vermont, New Hampshire and Maine. Cities, towns, railroad lines, canals and geographical features are all shown. Populations of Massachusetts, Connecticut and Rhode Island are listed in the lower right corner. 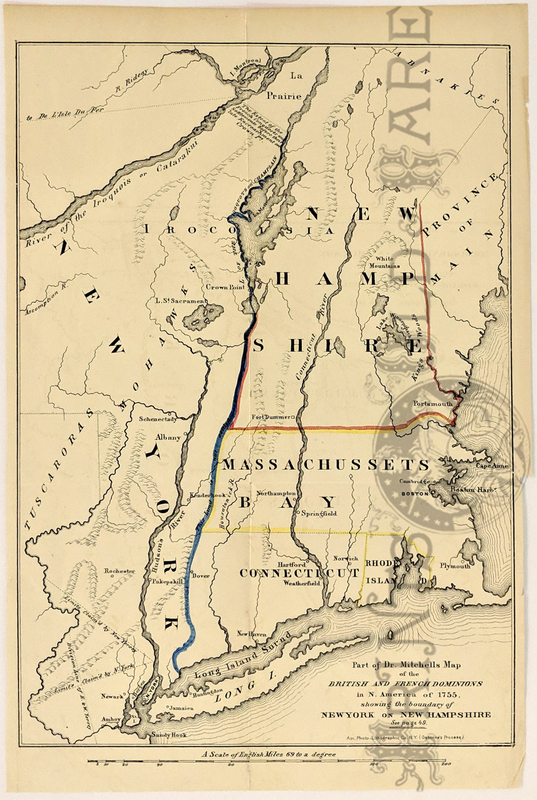 Revolutionary War Map: Route to Quebec. 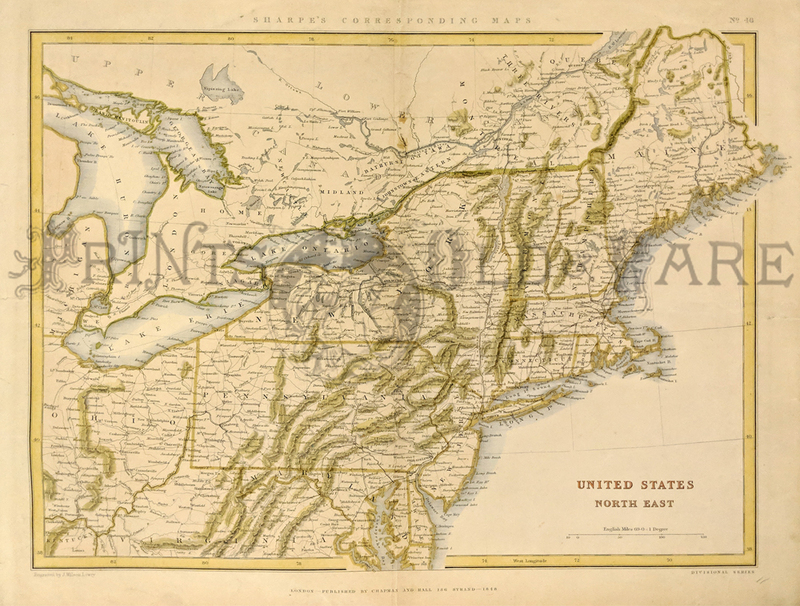 This original map, from Marshall's Life of Washington, is titled "A Map of the Country Which was the Scene of Operations of the Northern Army; Including the Wilderness through which General Arnold Marched to Attack Quebec." This refers to Benedict Arnold's march through the Maine wilderness in the late 1775. 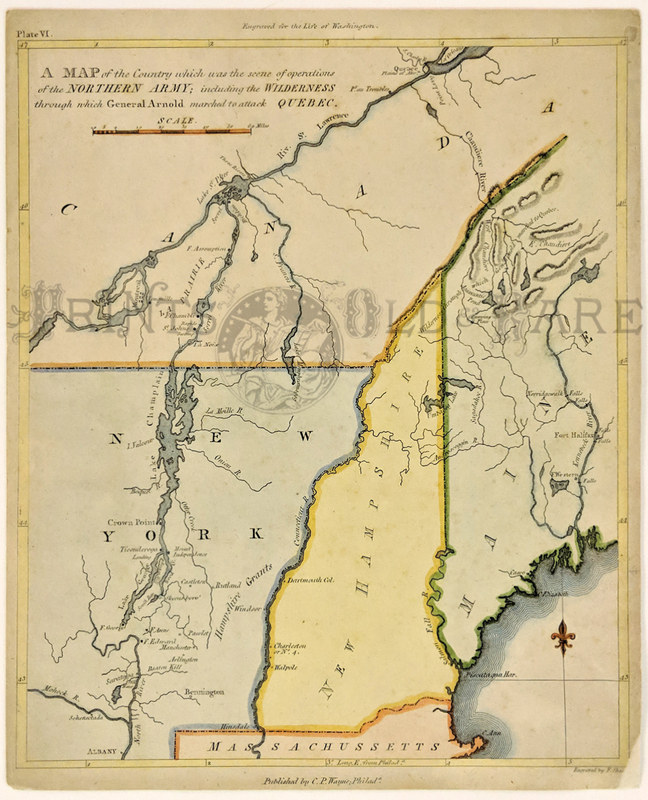 The map covers an area from northern Massachusetts to Quebec City. The area that is now Vermont is shown as part of New York. 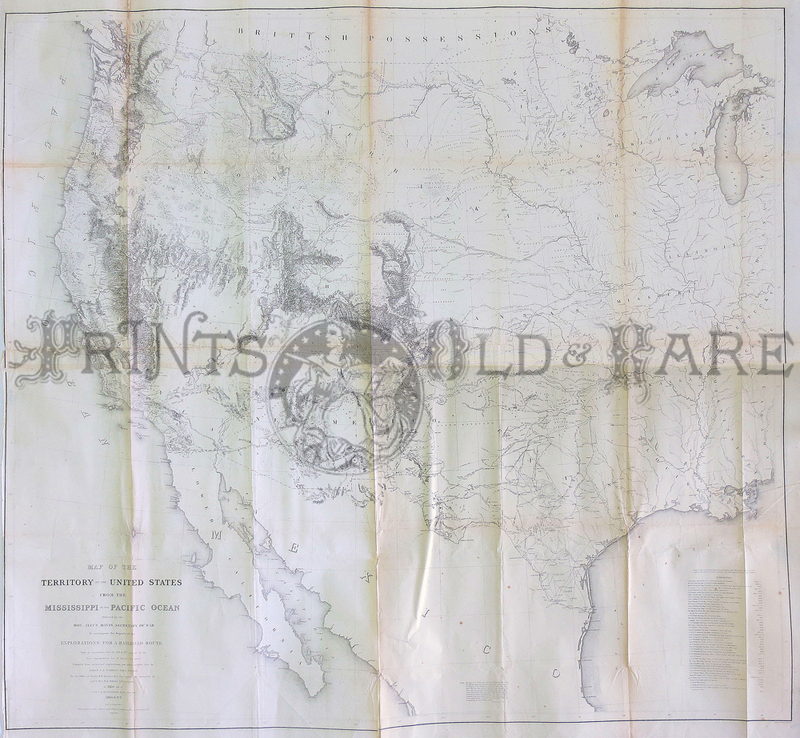 The map was printed by C.P. Wayne of Philadelphia, in 1807. 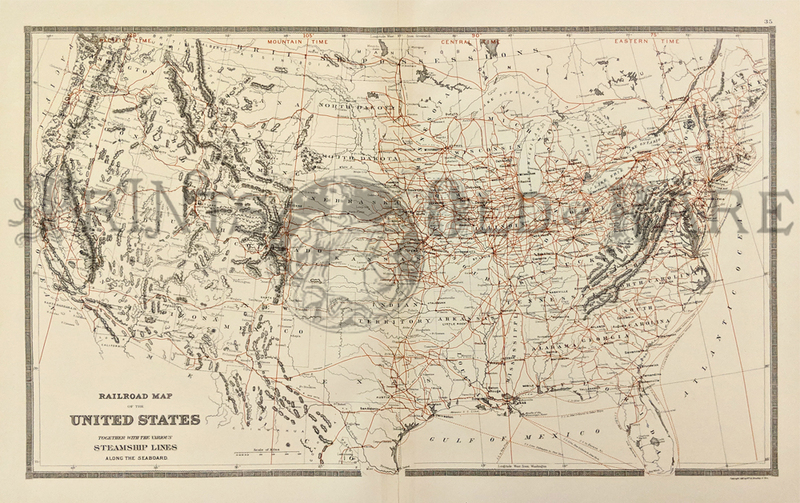 Early Road Map of United States 1919. 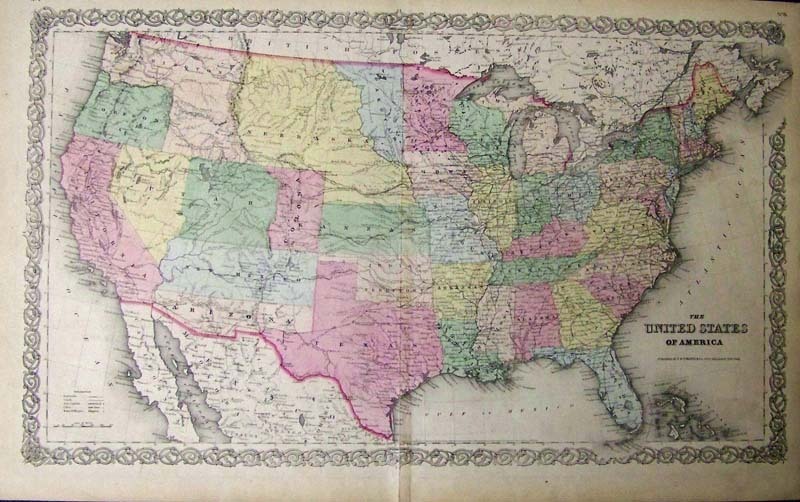 Clason's Guide Map of the United States. 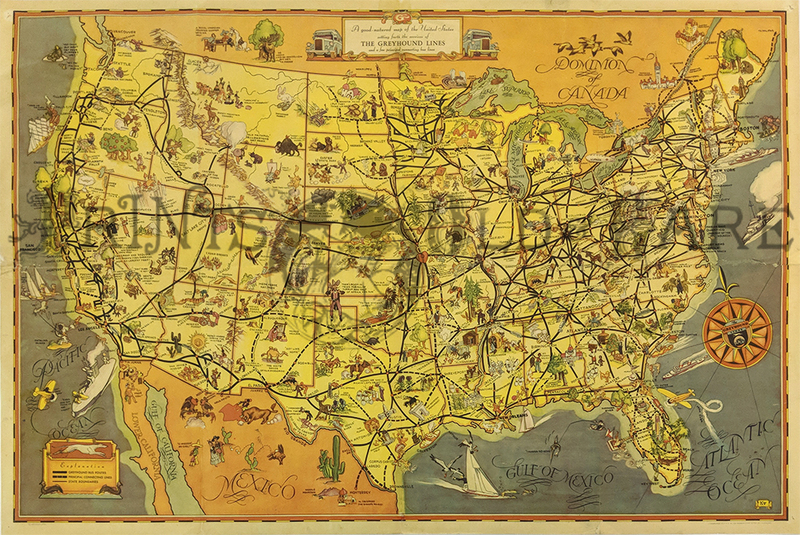 Shows railroad routes and lists population of large cities and states. 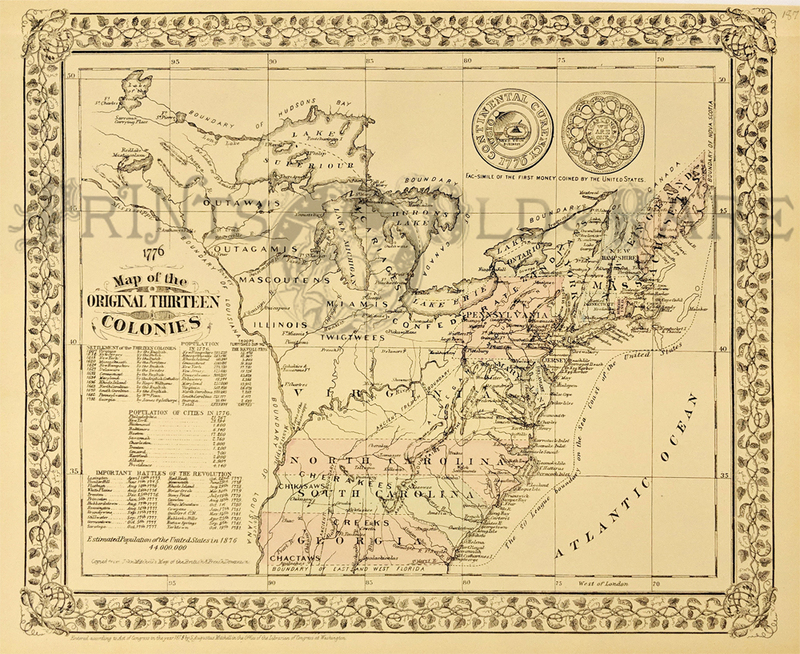 Re-issue of 1776 Map of the original thirteen colonies. Copied from John Mitchell's Map of the British & French dominion 1879. 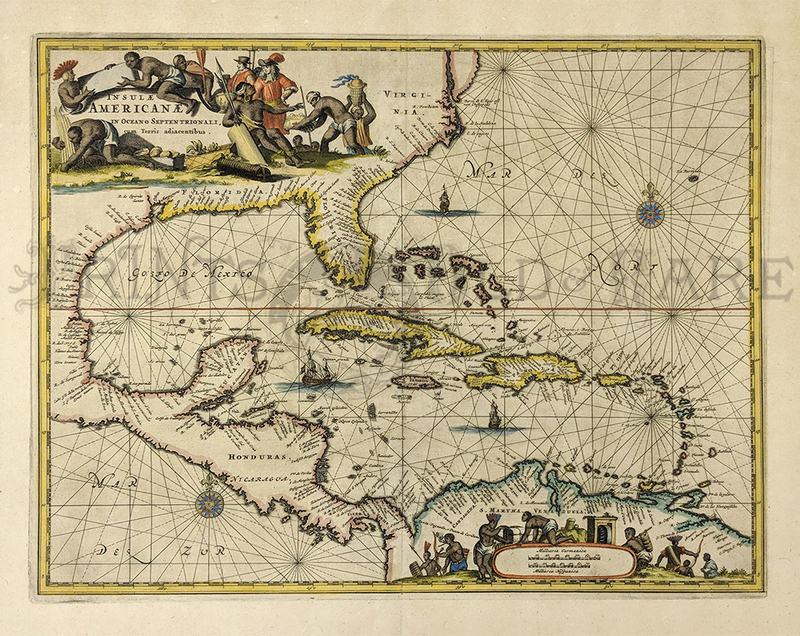 Hand colored map with inset views. Shows colonies, settlements, Indian tribes, roads, rivers, 30 league boundary of the coast of the United States, etc. Includes statistical tables and Fac-simile of the first money coined by the United States also shown. 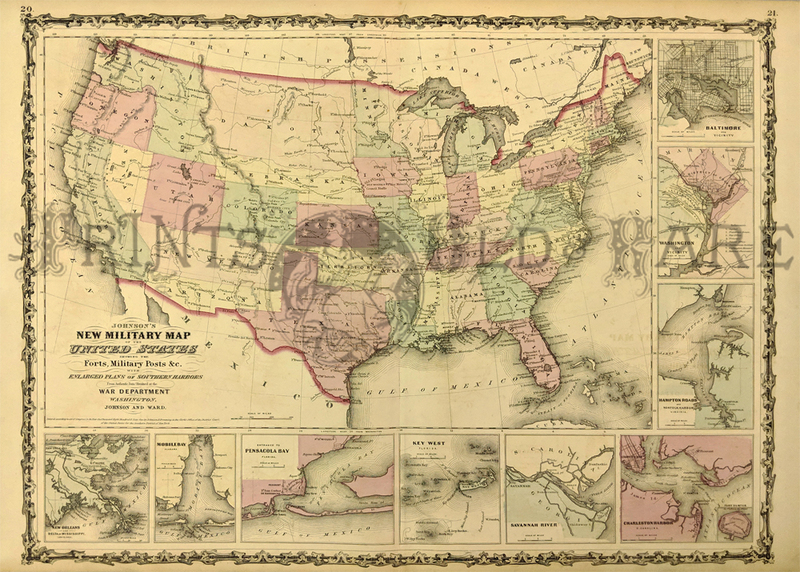 1857 Military Map of the U.S. prepared by Quartermaster General. Shows departments, forts, military districts, rivers, topography and settlements. 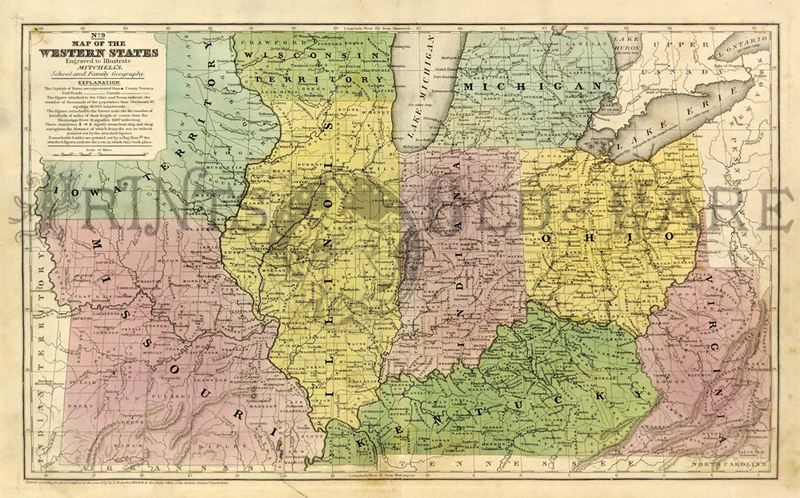 1848 North-East United States map. 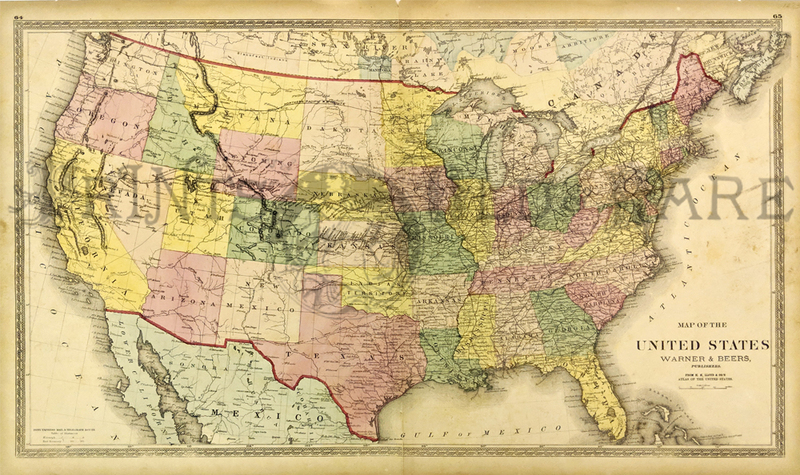 Hand colored English map by Chapman & Hall. Covers area from Maine to Virginia showing mountain ranges in the area. 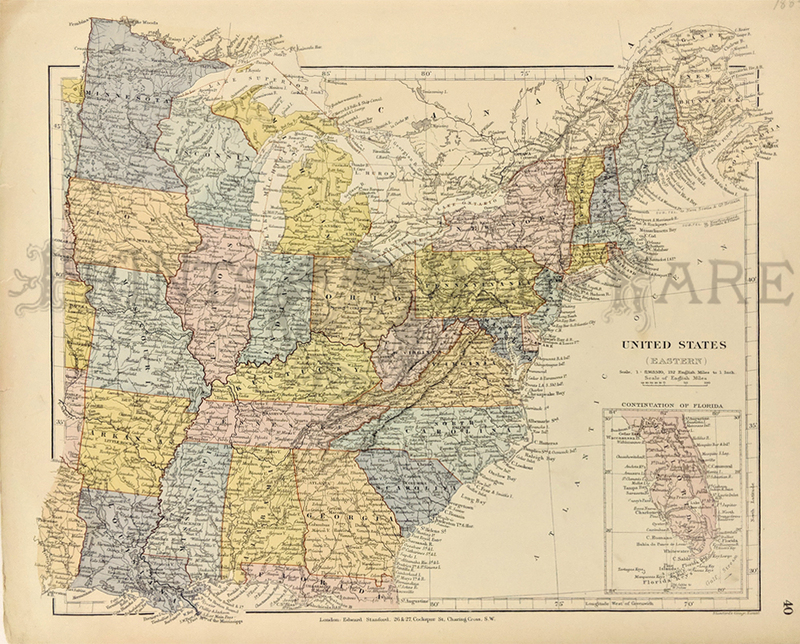 1850 Hand colored Lithograph Map of United States and Territories. Showing all the territories including Nebraska and New Mexico. Ackerman Lithographers. 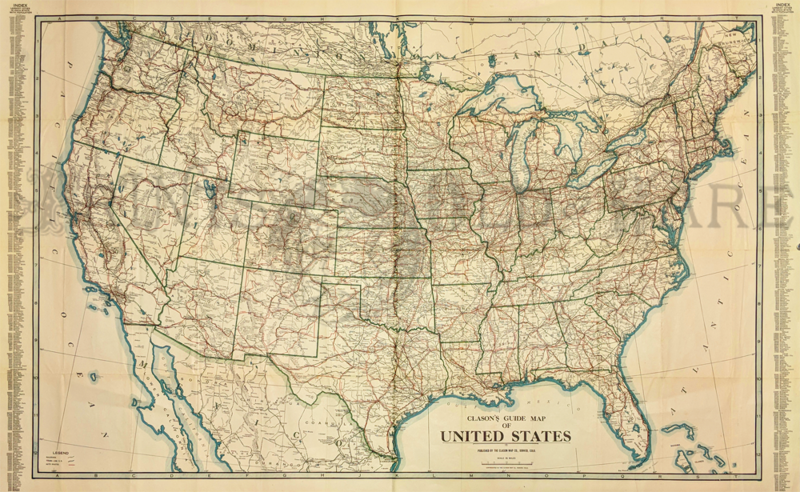 Early Road map of United States 1919. 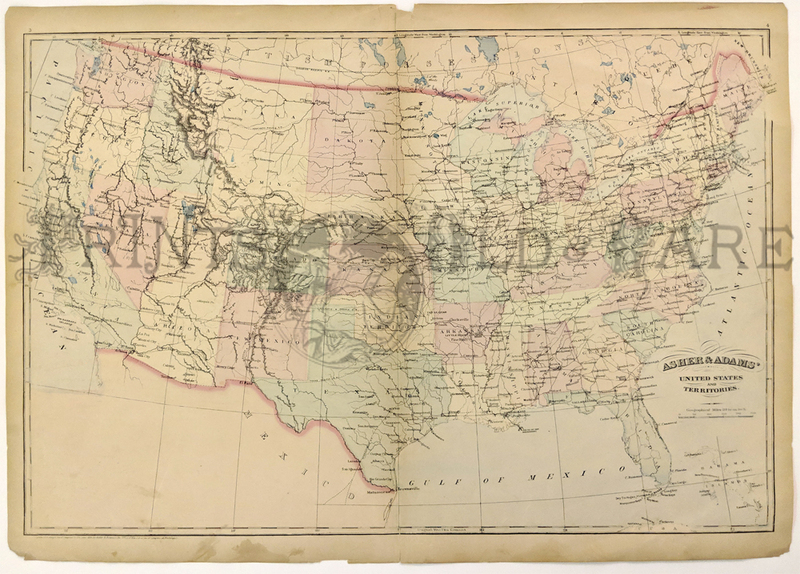 Clason’s Guide Map of the United States. 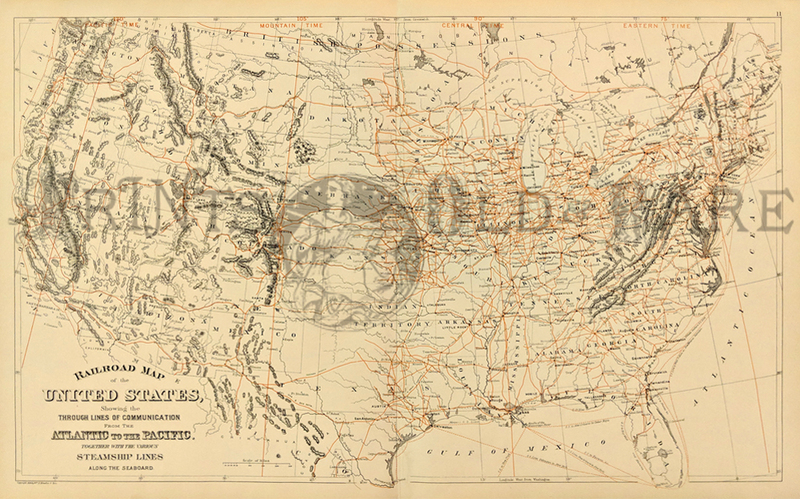 Shows railroad routes and lists population of large cities and states. 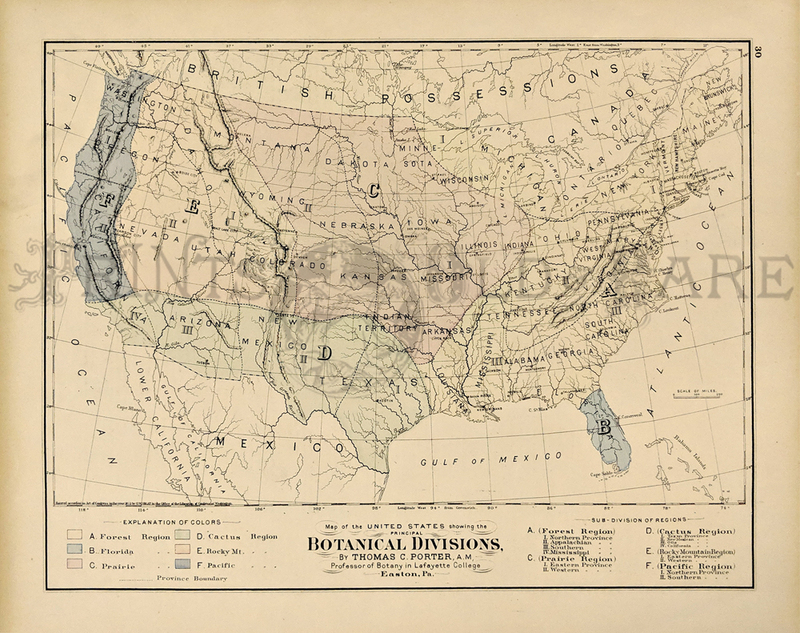 1868 Black and white copper engraved Indian Tribe U.S. Map titled, "Carte des Tribus Indiennes Al'Ouest Du Mississippi." 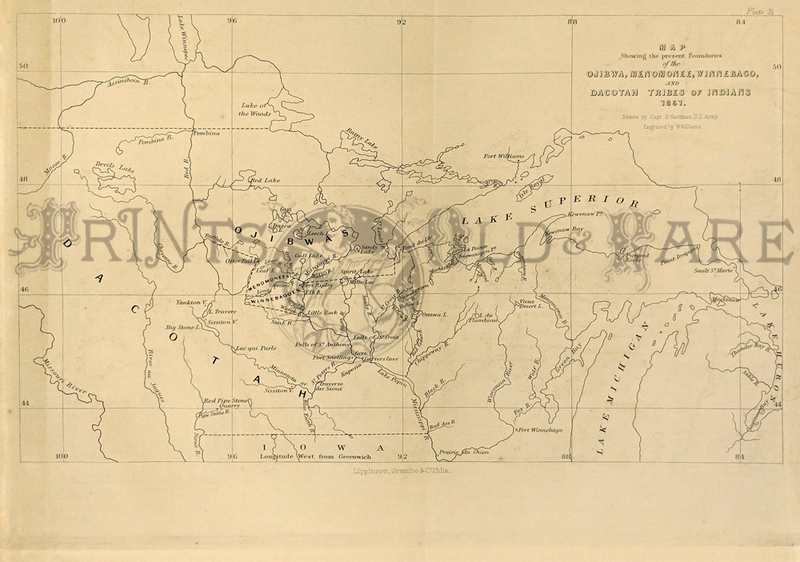 1851 Black and white copper engraved Indian Tribe map of tyhe mid-United States showing the Boundaries of the Ojibwa, Menomonee, Winnebago, and Dacotah Tribes of Indians. 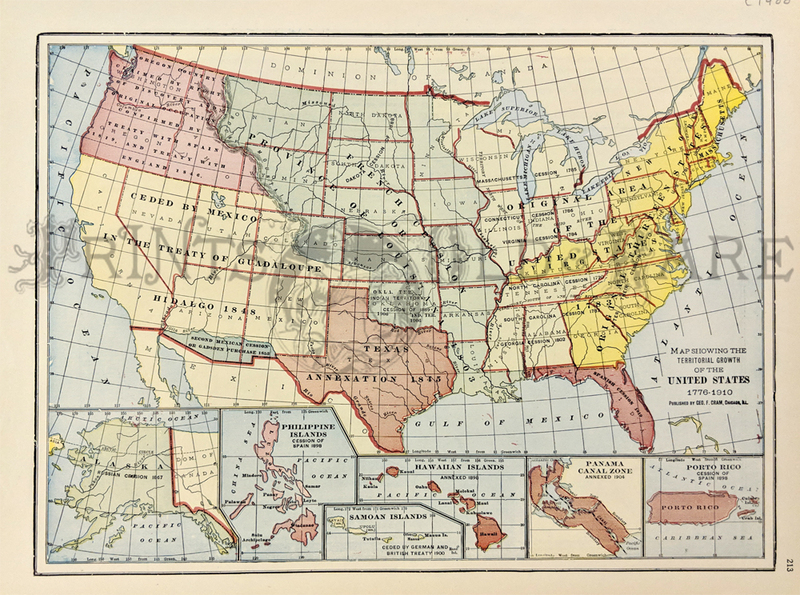 1891 Bradley's Atlas of the World's hand colored map of the United States, showing Indian Territory, mountain ranges, state capitols, and other pertinent places. Map of the Territories and Pacific States. 1865 Bowles. Original hand colored. 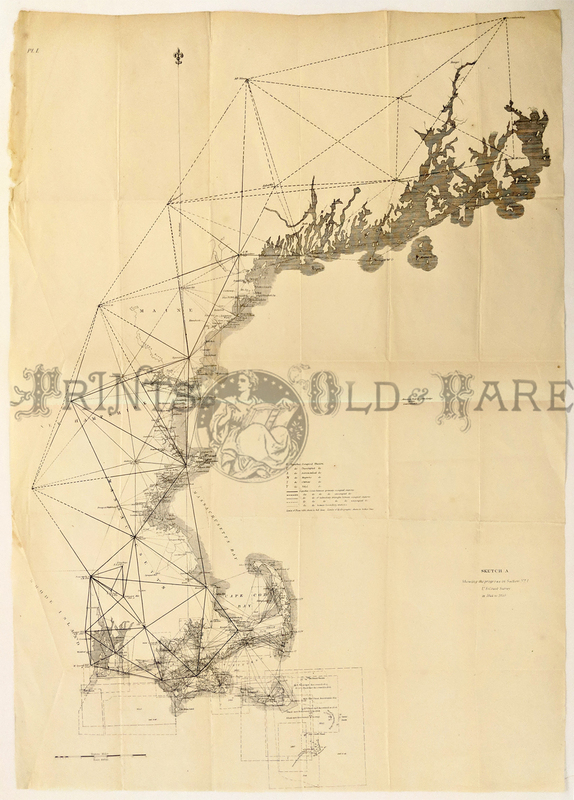 Shows the Butterfield Express and State route, mail routes and the tracks of the Colfax Expedition. Detailed inset titles "Plan of Central California on an Enlarged Scale" is at the lower right and covers the region from Santa Clara to Humbolt County. Good condition, missing edge of bottom left outside margin fold visible in top middle and small smudge outside top left margin. 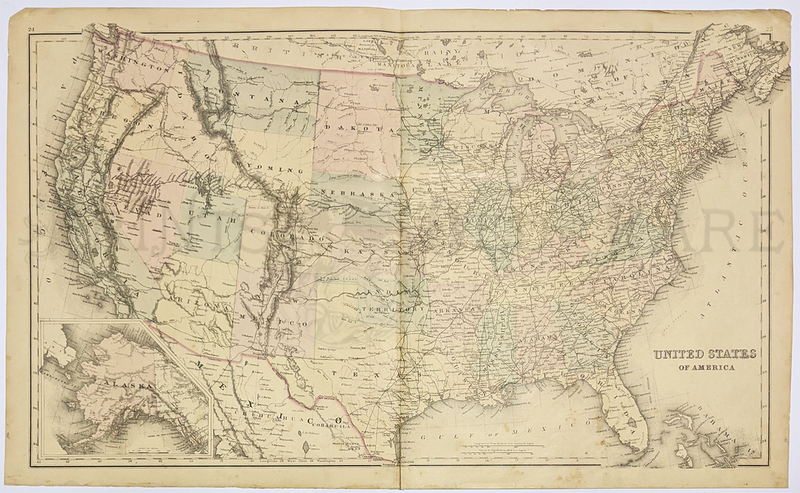 A Map of the United States by W. Williams for Lippincott 1854. 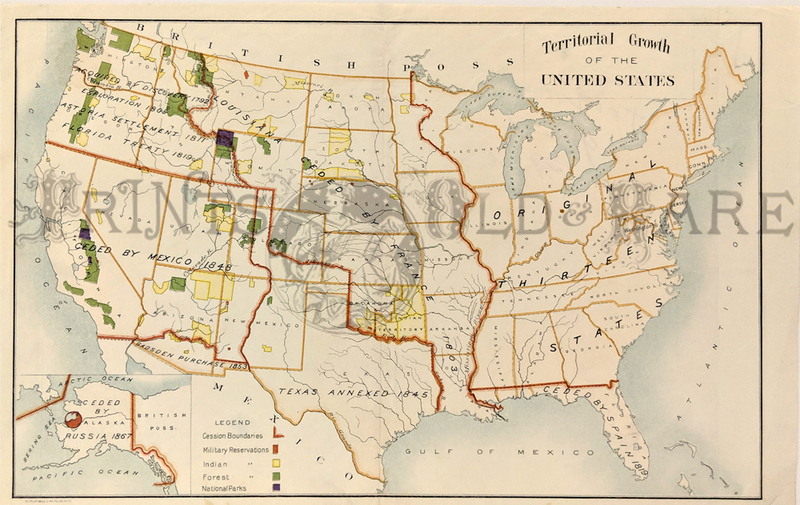 Shows Eastern U.S. to Texas & Nebraska Territory. Large inset of the Western Territories plus insets of Cuba, Havana, and Niagra Falls area. A wonderful map showing pre-Civil war development. Vibrant orignal outline colors. Some discoloration on orignal folds.